Having a runny nose can be a real nuisance. It is an extremely common complaint for people of all ages and I dare say that just about everyone experiences a runny nose on a fairly regular basis. Just because it is common and will normally clear up on its own in time does not mean you should simply live with it. 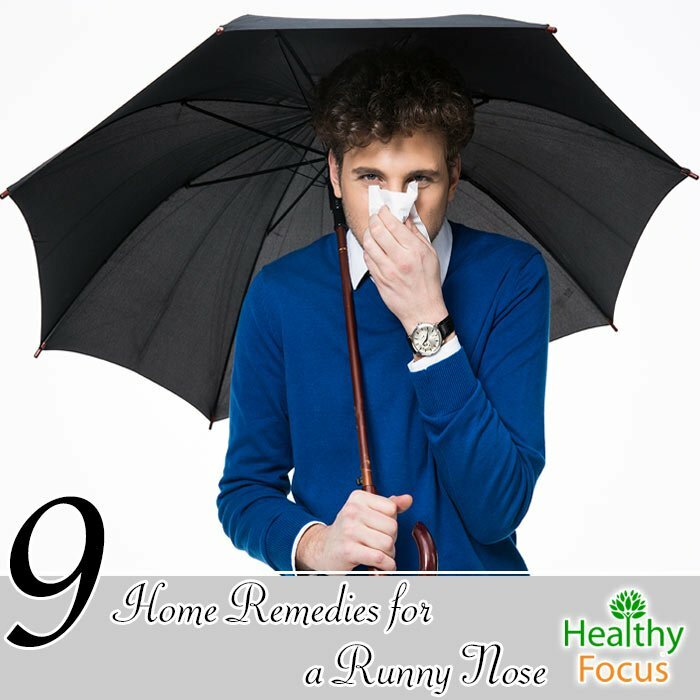 There are plenty of effective home remedies that can help you to get rid of your runny nose quickly and safely. A runny nose basically refers to the discharge or fluid coming out of the nasal passages. It can be a watery type of clear fluid but is sometimes viscous and thick. Like a stuffy nose, a runny nose is usually associated with swelling or inflammation in the lining of the sinuses and the nasal passages. A runny nose known medically as rhinnorhea is usually caused by some type of viral infection such as the common cold or influenza. Other causes of a runny nose are allergies, sinus infection and exposure to pollutants like smoke. There are of course plenty of pharmaceutical remedies for a runny nose but many of them can have unwanted side effects such as drowsiness. If you have a runny nose and you are looking for a safe and effective home remedy, why not try one of the many natural home remedies that we will list below instead? Turmeric is one herb that you should not be without. Its medical properties have been thoroughly researched and it is known to have an array of health applications including for a runny nose. Turmeric has extremely powerful anti-inflammatory properties as well as antibacterial, antiviral and antioxidant properties which make it ideal for your runny nose and respiratory issues like congestion and cold. Add half a teaspoon of your turmeric powder to a glass of water or milk and mix well. Drink up twice a day. Add a pinch of cayenne or black pepper to your milk for even greater relief. This remedy should give you immediate relief from runny nose as well as various other complaints like sore throats, colds and sinus congestion. Like turmeric, you will often see ginger featuring on lists of home remedies that cover a good range of illnesses. Ginger has excellent antioxidant, antiviral and antibacterial properties which are great for relieving a runny nose and congestion. Simply chewing on a few pieces of your raw ginger throughout the day can help alleviate a runny nose. Alternatively, you can make a cup of healthy ginger tea. Simply slice a few pieces of ginger root and add it to a cup or so of water. Boil the water, simmer and strain then let the ginger steep for ten minutes. Add honey, which is also an excellent remedy for your symptoms, and lemon to taste if you want. Garlic is another great natural remedy for runny nose and congestion. According to research, it has excellent antiviral, antibacterial and antioxidant properties which give it so many of its medicinal uses. As long as you can tolerate the pungent flavor, you can simply chew on a piece of garlic every now and again throughout the day for relief from your runny nose. Alternatively you can boil up a few cloves with a cup or so of water and allow the mixture to steep well. Strain and drink up several times each day with honey to taste. Garlic supplements are also available in several different forms. Most types of good quality honey have excellent antiviral and antibacterial properties which can help bring relief from your runny nose and other symptoms Honey is also very soothing and can help treat accompanying symptoms like a sore throat. While most honey can help, the best quality medicinal honey is Manuka honey. This Australian product may be quite expensive but it really does the trick and is well worth buying if you can afford it. You can add two tablespoons of your honey to a warm glass of milk and drink several times a day. Alternatively, try mixing a tablespoon of your honey with warm water and a few drops of freshly squeezed lemon. This will help boost your immunity and clear up your runny nose. Many essential oils can be used to help relieve your runny nose as well as being effective for various other symptoms of a cold or flu. Some of the best essential oils to help treat a runny nose are eucalyptus oil, peppermint oil and ginger oil but there are many more which will do a great job. The easiest way to use essential oils for your runny nose is to add a few drops to a handkerchief and inhale deeply throughout your day. A more effective method of using essential oils is to make a steam treatment. Fill your sink with hot water and add five or six drops of your chosen oil to the water. Cover your head and shoulders with a towel and inhale the soothing vapors for a few minutes or as long as you can tolerate. Cayenne pepper is another excellent treatment for a runny nose while it can also help clear up other symptoms of your cold such as congestion. It helps to increase nasal discharge allowing your body to flush any blockage or toxins which might be contributing to your symptom. Try adding plenty of this spicy pepper to your food and soups if you are experiencing symptoms of the cold or flu. Basil is a wonderful herb with excellent medicinal properties. It is antiviral, anti-fungal and antibacterial which can all help alleviate your symptoms. You can simply chew on some fresh basil leaves throughout the day. Another option is to make a basil tea. Add a handful of leaves to a cup or so of water and boil. Add some good quality honey to taste and drink up twice each day. Mustard is another spicy treat that can help overcome many symptoms of the cold including runny nose. Mustard has natural antihistamine and antiviral properties that should help alleviate your symptoms pretty fast. Add a few tablespoons of your mustard oil to a pot of boiling water. Cover your head with a towel and inhale the vapors for a few minutes. Alternatively, try heating up a little oil until it is warm. Use a dropper to apply a little oil under each nostril. One of the easiest home remedies for your runny nose but by no means the least effective is to use simple salt water. Salt water is effective because it helps to thin out the mucus making it much easier to expel. It can also help keep the nasal passage free of irritants. Mix half a teaspoon of salt into 2 cups of warm, distilled water. Tilt back your head and see a dropper to place a drop or two of your solution into the nostrils. Inhale gently and blow out your nose to remove the solution along with the mucus. You can also use a neti pot to achieve the same results. We hope that one of these excellent natural remedies will relieve your symptoms and get you back to health pretty quickly. Good luck and let us know how they worked out for you.